Superconductivity is a fascinating quantum phenomenon in which electrons form pairs and flow with zero resistance. However, strong enough magnetic field can break electron pairs and destroy superconductivity. 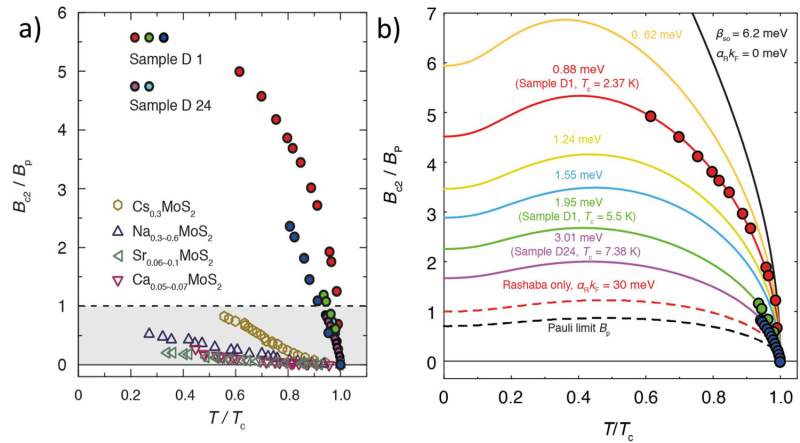 Surprisingly, experimental groups led by Prof. Ye and Prof. Zeitler in Groningen and Nijmegen found that superconductivity in thin films of MoS2 could withstand an applied magnetic field as strong as 37 Tesla. An explanation for the phenomenon was needed and Prof. Law's theory group at Hong Kong University of Science and Technology promptly solved the puzzle. The collective findings were published on 12 November in Science. Professor Law and his student Yuan proposed that the lattice structure of MoS2 thin films allows the moving electrons in the material to experience strong internal magnetic fields of about 100 Tesla. This special type of internal magnetic fields, instead of damaging superconductivity, protects the superconducting electron pairs from being destroyed by external magnetic fields. They called this type of superconductors, "Ising superconductors". They also predict that many other superconductors, which have similar lattice structure as MoS2, would fall into the same family of "Ising superconductors" as well. In addition to their survivability under a strong magnetic field, Professor Law's team pointed out that Ising superconductors can be used to create a new type of particles called Majorana fermions. These Majorana fermions would have potential applications in making quantum computers. "Many novel properties and applications of Ising superconductors have yet to be discovered," Professor Law said. "Now that we understand the mechanism of how certain materials become resistant to interference from external magnetic fields, we can look for materials with similar characteristics to those of superconducting MoS2." Professor Law said. "I am sure we will unearth more Ising superconductors soon."